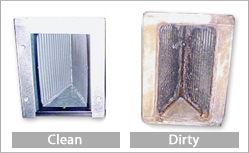 We have been preaching to homeowners for years that the effects of dirty coils are catastrophic to your heating and air conditioning system. Instead of Performance Heating and Air Conditioning continuing to preach the importance, we thought we would share some studied effects and the costs of running your HVAC system with dirty coils. Studies have been done that show real numbers. The study was centered on well-maintained condenser and evaporator coils vs poorly maintained.